Drew Brees and the New Orleans Saints will travel to Carolina to clash with Cam Newton and the Panthers in the first game on the NFL Confidence Pool Week 9 sheet. A number of marquee names will square off against one another in Week 9. 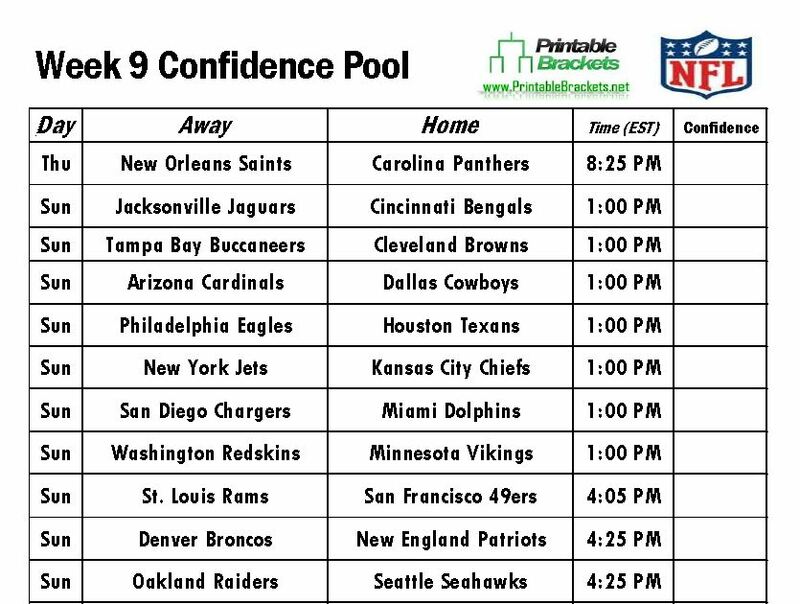 You can set up a pool at the home or office with our NFL Confidence Pool Week 9 sheet. For fans of a more traditional pool, you can also use the NFL Week 9 Pick Em pool sheet. Both sheets are instantly downloadable, printable and completely free from PrintableBrackets.net. The rivalry between Saints and the Panthers has emerged as one of the better matchups in the NFC in recent years. Carolina topped New Orleans, 17-13, in the de facto NFC South title game in Week 16 last year, but was bounced in the second round of the NFC Playoffs. In early games on the NFL Confidence Pool Week 9 sheet, Tony Romo and the Dallas Cowboys will host Larry Fitzgerald and the Arizona Cardinals in Arlington. Adrian Peterson and the Minnesota Vikings will welcome Robert Griffin III and the Washington Redskins, while Nick Foles and the Philadelphia Eagles will be on the road to face the Houston Texans. The afternoon action on the NFL Confidence Pool Week 9 sheet is highlighted by a clash between two of the greatest quarterbacks of all time, as Peyton Manning and the Denver Broncos will battle Tom Brady and the New England Patriots. Denver dispatched of the Patriots in last year’s AFC Championship Game. Six teams have a bye in Week 9: The Atlanta Falcons, Buffalo Bills, Chicago bears, Detroit Lions, Tennessee Titans and Green Bay Packers.